Now you can feel your monitor mix, too. BOOM-1 is designed to dramatically enhance a performer's personal mixing experience by adding powerful, optimally-processed low-frequency tactile information to any in-ear or headphone monitor mix. Designed by the personal monitor experts, the BOOM System is easy to use and provides a natural low-frequency extension to your monitoring environment. 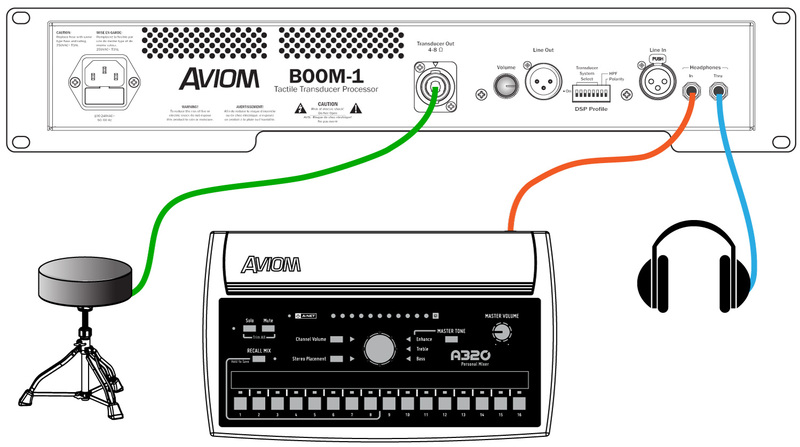 The BOOM System products are compatible with all Aviom personal mixing systems and can easily be connected to any audio device that can provide a headphone or line-level output. In-ear monitors provide a detailed and personal monitoring experience. Adding a well processed low-frequency tactile transducer (also known as a 'bass shaker') to a drum throne, keyboard seat, guitarist's stool, performance platform, or even to the floor of a stage, allows the body to feel bass frequencies, adding realism to the mix. 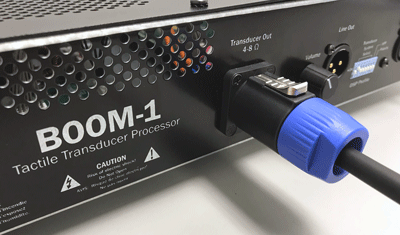 The BOOM-1 Tactile Transducer Processor brings Aviom-optimized DSP to the tactile experience. Being able to hear and feel your mix can significantly improve the user experience when using in-ear monitors and/or headphones, providing powerful sound usually achieved only with high volume and large, high quality speaker cabinets. Learn how to set up and optimize your BOOM System products and personal mixing system with the videos avaiable here and on the Videos page. Tactile transducers are especially beneficial to performers using electronic drum kits, as well as guitar and bass amp simulators. Why? Because playing an acoustic drum kit or an electric guitar or bass through an amp actually vibrates the floor and this vibration becomes part of the live performance experience. When you switch to an electronic drum kit or a modeled amp system without speaker cabinets, those natural vibrations are eliminated. ...Until now. Using personal mixers and IEMs/headphones along with tactile transducers allows performers to achieve powerful, exciting monitor mixes at lower in-ear levels. This reduces sound-level-induced fatigue allowing longer,	more enjoyable performances while also promoting long-term hearing health. 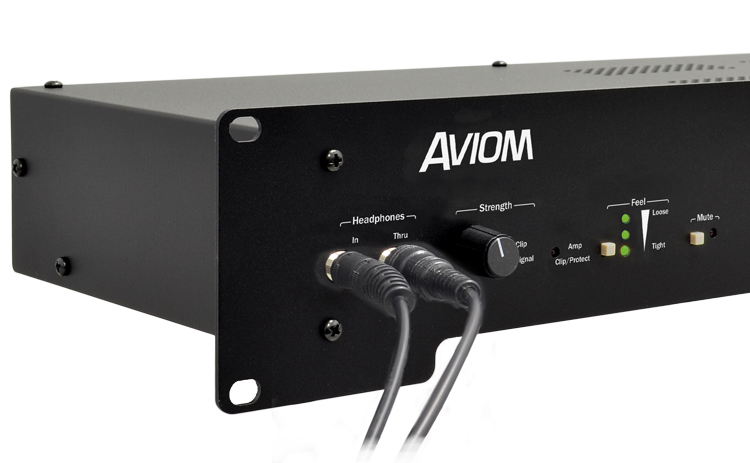 Aviom makes adding tactile transducers to your monitoring system as easy as possible by providing a set of products that are designed to be plug-and-play simple. 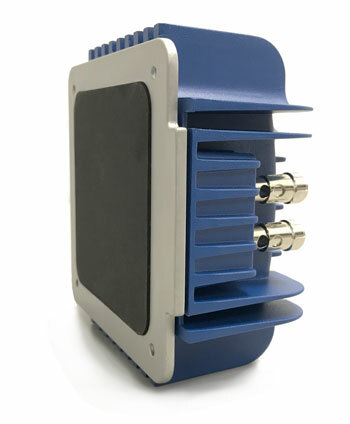 We've partnered with some of the industry's leading manufacturers to offer tactile-enhanced versions of their products that can be directly connected to the BOOM-1 Tactile Transducer Processor. The CTT-1 Clamp-On Tactile Transducer has a universal mount that makes connecting a tactile transducer to the stem of most drum thrones or stools easy. 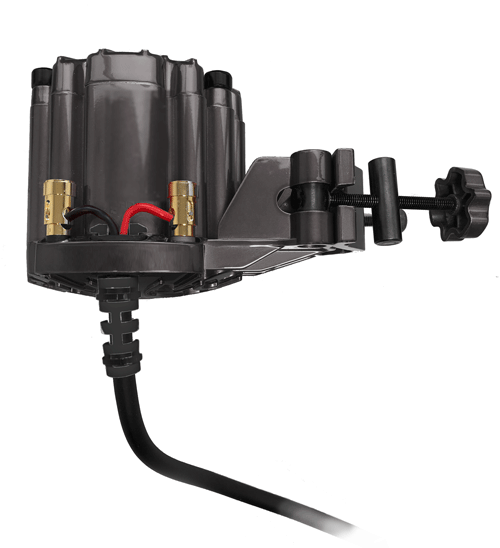 At the heart of the CTT-1 is a premium ButtKicker® transducer, and an integrated locking speaker cable ensures a solid connection to the BOOM-1 processor. 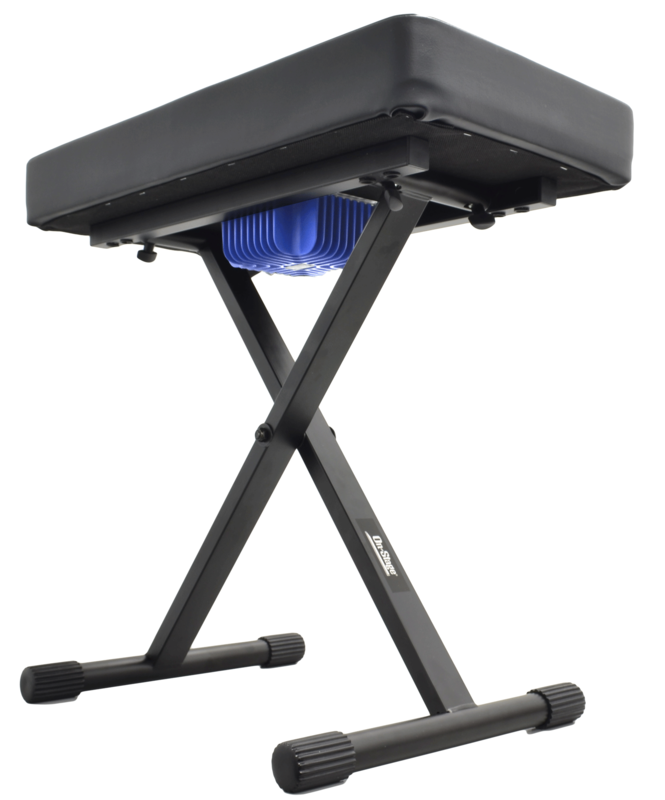 Aviom's PFS-1 Performance Stool combines a sturdy QuikLok® performance stool with a built-in tactile transducer system. 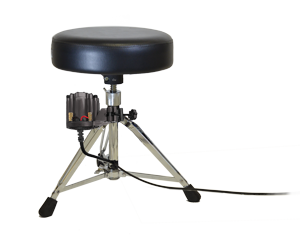 The stool has an adjustable seat, back, and foot rest that allows it to be customized to suit any player. Simply connect the stool to the BOOM-1 using the included locking-type speaker cable. 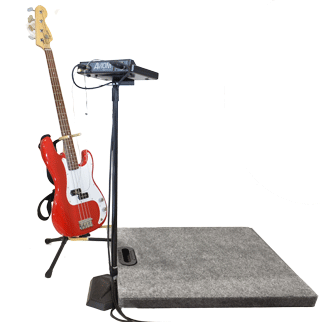 The PLF-1 Platform, powered by ButtKicker®, is a portable performance platform that is the perfect solution for those performers—especially bass players, guitarists and vocalists—who stand on stage. 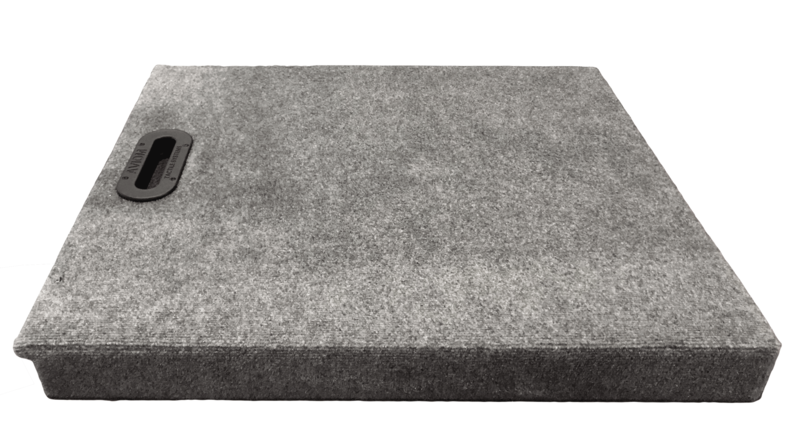 The sturdy 28" x 32" (71 x 81cm) platform uses a premium ButtKicker tactile transducer and is designed with an opening in the front to allow convenient positioning of mic and music stands. Simply connect the platform to the BOOM-1 using the included locking-type speaker cable. The KBS-1 is an adjustable On-Stage Stands® keyboard seat with an integrated tactile transducer system. Simply connect the seat to the BOOM-1 using the included locking-type speaker cable. And if you need an extra locking speaker cable, we have that, too. 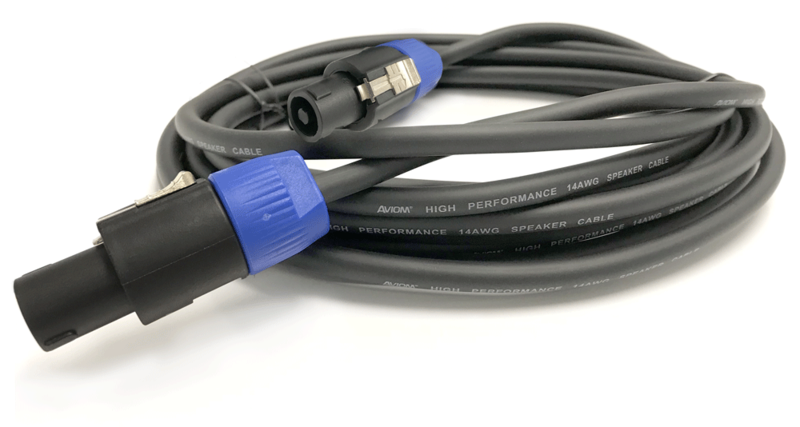 The SPK-5 is a 5-meter (16.4 feet), 14AWG heavy-duty 2-conductor cable with locking connectors. A tactile transducer is similar in concept to a speaker (without the paper cone) and is designed to be most effective reproducing low frequencies like those produced in music by bass instruments and drums (typically 200Hz and below). They are also quite effective when used for games and with sound effects for movies. But since a tactile transducer is designed without a speaker diaphragm, it can be used to allow you to feel low frequency vibrations while making very little audible sound. That makes a tactile transducer a great addition to a personal mixing system when performers are using in-ear monitors. The frequency spectrum is more complete, and you'll be able to monitor at lower volumes while retaining all the fullness and excitement of performing at higher volumes. 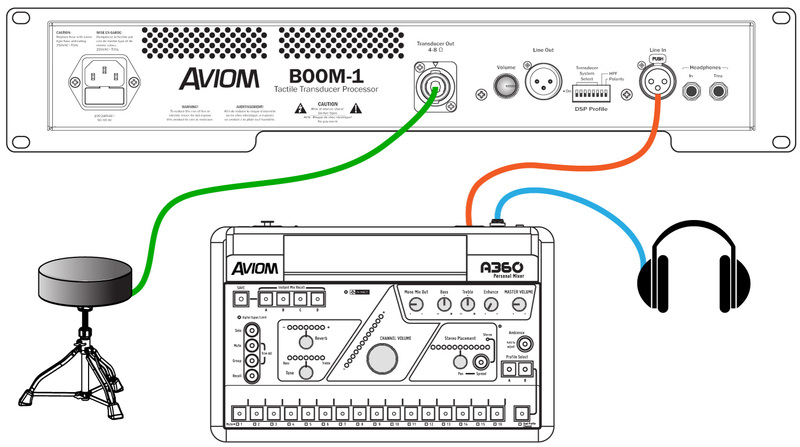 Compatible with Aviom's industry standard A360, A320, and all other Personal Mixers, the BOOM-1 can be connected easily to the line- or headphone-level audio outputs of a performer's Personal Mixer. 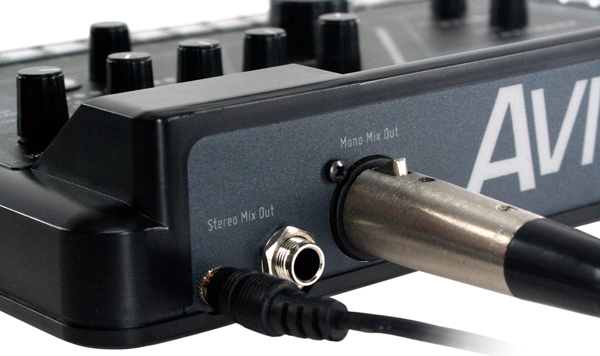 BOOM-1 can be added to any personal mixer or to mixing consoles. All that's required is a stereo headphone output or a dedicated mono line-level output. BOOM-1 takes care of the rest. • Connect the TRS stereo headphone output from a Personal Mixer to the BOOM-1 Tactile Transducer Processor's headphone-level input. • For A360 Personal Mixers there's even a dedicated XLR line-level input on the BOOM-1 rear panel. Just connect a standard mic cable from the the A360's Mono Mix Out jack instead of using the Headphone output. 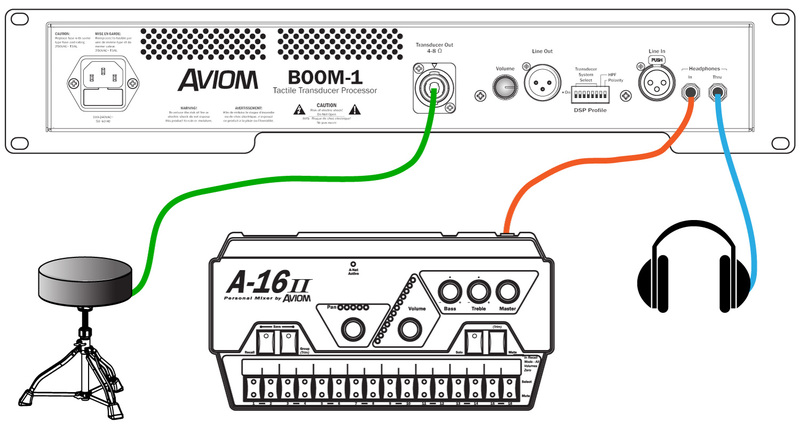 For mixing consoles, connect any aux send to the BOOM line input. 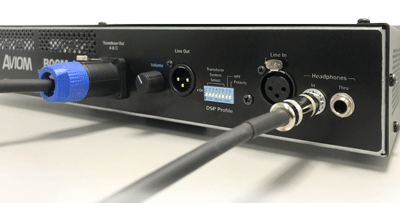 • Connect the Transducer Out to your tactile transducer using a locking-style speaker cable. That's it; connect your earbuds or headphones and you're ready to start mixing. The Strength setting controls how much of the source signal from your mix is sent to the tactile transducer. Use the Feel control to choose an optimized DSP setting from Tight to Loose that best suites you and your music. The examples below show various Personal Mixers connected to the BOOM-1 Tactile Transducer Processor. 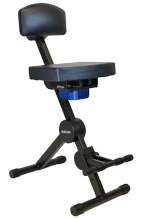 The system diagrams use a drum throne as an example, but you can use any tactile transducer equipped seat, stool, performance platform, or stage instead. The connections between the BOOM-1 processor and transducer input are the same.